Actin filaments are widely distributed throughout cells, forming a range of cytoskeletal structures and contributing to an even broader range of processes. Some of the functions are widely observed across many cell types while in other cases actin filaments may contribute to processes that are cell type specific. Actin filaments are widely distributed throughout cells, forming a range of cytoskeletal structures and contributing to an even broader range of processes. Actin filaments are crucial for tissue organization and for establishing cell polarity and cohesion among epithelial cells. For example, a core of actin filaments provides microvilli structural support and enables them to increase their surface area and nutrient-absorbing capacity. These structures are found on the apical surface of epithlial cells lining the small intestine. In another example, the integrity of epithelial cell layers or sheets is maintained by a belt of actin filaments (i.e. adhesion belt). This belt links the cytoskeleton of adjacent cells. Also, certain cells use actin filament rigidity to sense vibrations, such as those found bundled on the surface of hair cells in the inner ear (called stereocilia, not shown), which tilt in response to sound. Although the actin bundles in stereocilia are stable for the lifetime of a cell (which can be decades), the individual actin filaments are continuously remodeled and replaced once every 48 hours (on average). 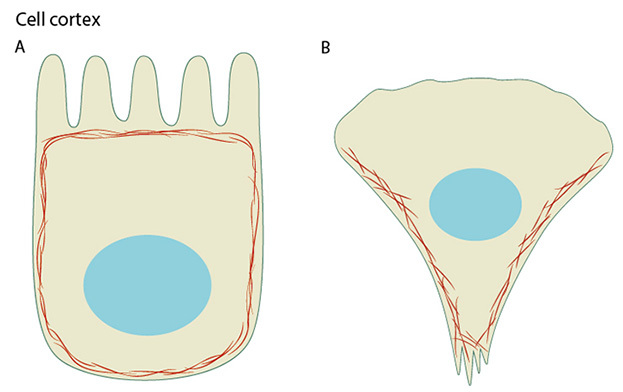 Actin filaments are the primary cytoskeletal component to drive cell motility. Here, actin filaments found in membrane protrusions such as filopodia and lamellipodia rapidly assemble and disassemble. 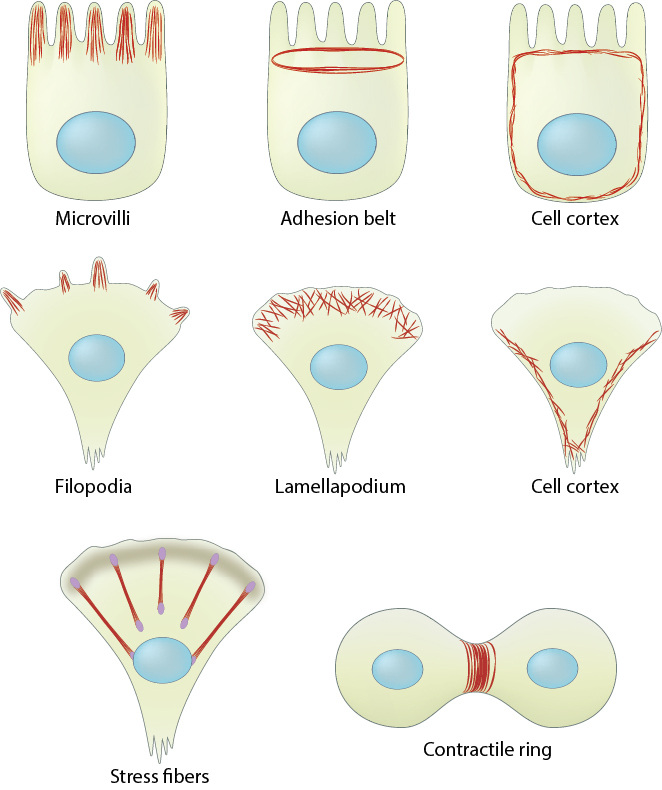 These cellular structures are essential in cell migration and are predominately found at the leading edge of a moving cell. They also allow the cell to probe or sense its microenvironment. Actin filaments are also found at the trailing edge in the form of the cell cortex, which lies adjacent to the plasma membrane. 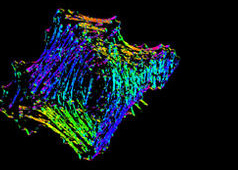 More stable arrays of actin filaments, such as those found in stress fibers, allow a cell to brace against the underlying surface. Actin-associated myosin motor proteins use ATP hydrolysis to exert forces against the stress fibers during muscle contraction; the energy of hydrolysis can also be converted to tensile forces at the trailing cell edge to promote edge retraction in motile cells. Actin-based motile structures are disassembled before cell division, which causes the cell to stop moving and become more rounded. 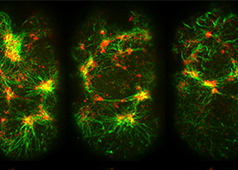 More stable actin bundles remain polarized and contribute to the orientation of the microtubule network that serves as the mitotic spindle. The proper assembly, orientation, and contraction of an actin filament ring (i.e. contractile ring) serves to pinch and separate the daughter cells during cell division. Actin filaments are an important structural feature in the head of sperm. The rapid relaxing of coiled actin filaments during the acrosome reaction  allows the sperm head to penetrate further into the egg. Microtubules influence actin assembly to help organize the polarized actin network.